The winger had scored seven goals in 10 matches prior to suffering a fracture in his foot before suffering a groin strain on his return last month but he is back in the squad for tonight’s trip to Partick Thistle and Robertson hopes the enforced break has not stifled Walsh’s impact. The Inverness manager said: “Having him back is massive. He is our second top goalscorer – Jordan White is on 13 and Aaron Doran and Tom are on nine each. “He was having a purple patch before he got injured, scoring in a great run of games. “It is vital to us and what we want to achieve to have as many players as possible who are capable of scoring goals. “While he may not start tomorrow night, he is back in the squad and he is certainly looking sharp in training. “With the amount of games coming up – three in eight days – he will certainly get a start in one or more of those three matches. 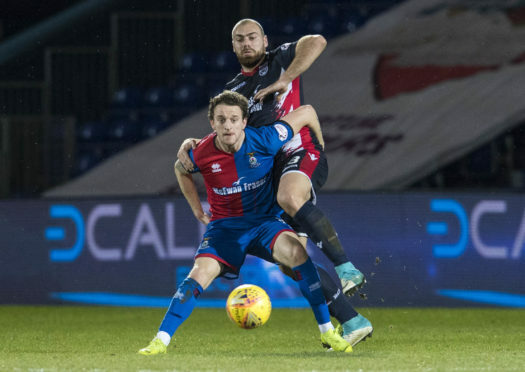 Walsh returns with Inverness chasing a win which will take them into the play-off positions above Dunfermline. Robertson, who also welcomes Kevin McHattie back for the trip to Firhill tonight, said: “A win would put us back in the play-offs zone, for 24 hours. Obviously Dunfermline will play on Saturday. “It is what it is – we have a chance to put pressure on teams above us by grabbing three points. “Thistle will be looking at it in exactly the same way, wanting to put pressure on Alloa below them and Falkirk and Queen of the South just above them. “It’s a massive game for both teams and both want the points for different reasons. We want to jump into that play-off spot and Partick want to jump out of the play-off spot at the bottom.